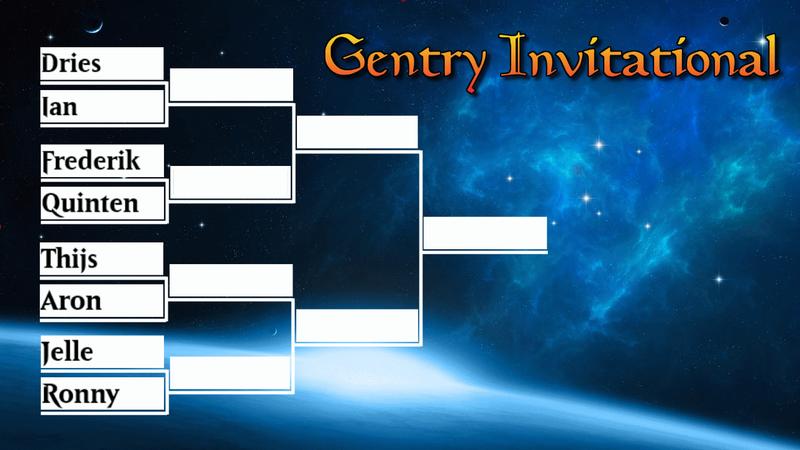 The Gentry Invitational was held on February 25th, allowing some of the best performing players we have in our community to battle it out on camera to claim the first bye for the upcoming Gentry Open which will be held on April 8th. That yielded the bracket you can see below. Aron won his slot with his win at the previous Open. Dries and Ronny came from the St Niklaas leaderboard. Quinten grabbed his slot through the Bredene Leaderboard. Frederik, Thijs and Jelle locked in through the Outpost Gent leaderboard. And finally, since Jelle was already qualified through the Outpost board, Ian, as the runner up secured a slot through the World end’s Comic Leaderboard. Unfortunately there was insufficient footage of this match available after the technical issues we had. We managed to save enough of the coverage to present gane 2 and 3 to you. We are very sorry to report the video quality is lower but at least the audio has no annoying sounds and I learned to breathe less into my microphone. 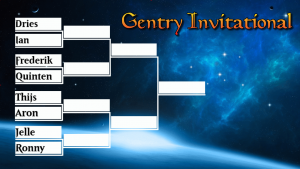 I hope you enjoyed the coverage and are looking forwar to the Gentry Open already!